Necrotizing Fascitis is a progressive inflammatory infection that spreads rapidly. It is located in the deep fascia and subcutaneous tissues and can result in increasing pain and localised swelling in the feet. Although the onset of this condition is often invisible the progressive and aggressive spread of this disease can cause death. Although rare, it is nevertheless a serious infection. Necrotizing Fascitis is a condition that is usually associated with a wound or lesion. When this condition develops in the feet it will result in the inflammation of the connective tissues. Individuals experiencing underlying chronic health problems like diabetes, heart disease and/or alcoholism are most likely to develop this progressive infection. It is also known as a flesh-eating bacteria that is a rare infection of the skin and subcutaneous tissues. What causes the destruction of the skin and muscle is the release of toxins in the tissues. The toxin that is released can activate the T-cells, which cause the overproduction of cytokines that impact on systemic illness that is severe. Necrotizing Fascitis usually develops at the initial site of trauma. This trauma may be severe or minor, although in some cases the reasons may be unapparent. Individuals will experience intense pain as the tissue becomes progressively swollen. Vomiting and diarrhoea and fever are also common symptoms that escalate rapidly making the patient appear very ill.
Fever that is combined with light-headedness, breathing difficulty, shock and/or a sunburn rash may also be signs that this disease is evident. 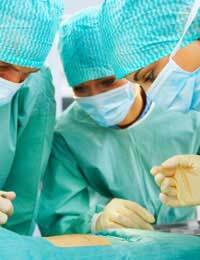 Severe pain at the site of a wound after surgery is also a warning sign. If the bacteria lies deep within the tissues of the foot signs of inflammation may not be obvious. Redness, hot skin and severe swelling, however, will be evident if the inflammation is not deep. The skin may also become discoloured, appearing like violet bruising, and blisters may also form as the skin begins to die. Infection of this flesh-eating bacteria spreads very rapidly so quick treatment is essential. Without medical help and/or surgery Necrotizing Fascitis progresses rapidly and eventually leads to the death of the patient. Diagnosis is carried out and confirmed by the appearance of the tissues that are examined by microscopic evaluation, X-rays and scans. Antibiotic treatment, combining a variety of intravenous antibiotics, should be started as promptly as possible. If treatment is not started in time amputation may be required in order to stop the spread of the disease. In smaller wounds skin grafting may be required once the spread of the bacteria has been halted. Additional supportive care for kidney failure, breathing difficulties and shock may also be necessary. If you have a wound or cut it is essential that care is taken over the cleaning and bandaging of this area. To stop the risk of disease wounds must be cleansed, disinfected and dressed appropriately to minimise the spread of infection. Dressings should be sterile because they act as a filter to keep bacteria away from the wound.